Note: CreditGUARD doesn’t support the use of cryptocurrency. To that end, we believe our readers and clients should be educated about all manner of financial issues including the current trends in digital forms of currency. CreditGUARD only recommends the use of FDIC-secured U.S. legal tender. Over the past ten years, the rise of cryptocurrency has been an attention-grabbing topic of interest in the financial world. Financial experts debate the validity and value of this new digital-only currency in newspapers and TV. If you are less attuned to the machinations of the financial market, cryptocurrency can be incredibly confusing. With its own set of terms, like blockchain and P2P, cryptocurrency is not easily penetrated by novices. 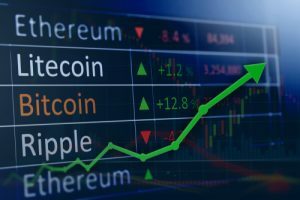 For those interested in purchasing cryptocurrency or just curious about its rise, the information below will give you the basic knowledge of the trend. Make sure to do extensive research before making any choices regarding cryptocurrency to avoid potential financial missteps. CreditGUARD doesn’t recommend the use of unsecured currency of any kind. FDIC-backed legal tender is a safe place for your income. Cryptocurrency is a digital-only currency divorced of a country, and financial institution likes banks. The digital security of an individual cryptocurrency is done through a blockchain. A blockchain is a system of multiple computers that uses a series of mathematical algorithms to keep currency secured by privately recording all transactions. Cryptocurrency is the term for the concept, but the actual currency has multiple names. The most popular is Bitcoin with others such as Litecoin, Ethereum, and EOS gaining value. Like any other type of currency, cryptocurrency can be used to purchased goods and services. The cost of each currency is determined by demand, and its finite amount. For example, there are only a potential 21,000,000 Bitcoins in existence. Like any new and exciting financial trend, there are pros and cons to cryptocurrency. Some consider the main advantage of cryptocurrency to be the fact it’s decentralized. However, “decentralized” means it’s not backed by any monetary standard. Some users “mine” for cryptocurrency instead of purchasing them. This (less than honest) act takes a significant amount of time and technical know-how and is highly risky. The biggest detractor is their lack of true, concrete value. Without banks or a government, the value for each piece of cryptocurrency is speculative and volatile. This trait causes the value to vary greatly, even within a single day. For tax purposes, claiming cryptocurrency is still new and unstandardized. Due to its digital-only existence and early stages, cryptocurrency is rife for potential scams. If you’re interested in entering the world of cryptocurrency, be aware of the following pitfalls. Buying and selling currency is done through 3rd party cryptocurrency exchanges. These sites are disassociated with the currency companies, which means they are less secure. Before using one, make sure to research the exchange that works best for you. Horror stories of cryptocurrency being stolen from exchanges are quite common. Storing cryptocurrency in a digital wallet is also open to the same third party security issues. Don’t get fooled by group cryptocurrency mining schemes, as they are often just a new version of the classic Ponzi scheme. CreditGUARD doesn’t condone or recommend the use of cryptocurrency — the only way to avoid these dangers is by using safe, federally secured U.S. currency. If your current financial situation is filled with missed monthly payments and calls from debt collectors, it’s time to call for help. Take control of your financial life with CreditGUARD. Our team of highly trained and certified credit counselors are ready to assist you in creating a brighter future. Through our credit counseling and debt management programs, you can take your first step today.